The National Disability Insurance Scheme (NDIS) is a new way of funding adults and children with disability, or children with developmental delay. The NDIS is designed to empower adults and children with disability to work towards their goals, to identify the disability related support they need to meet their goals, and to choose where they would like to buy their supports. The NDIS has developed the Early Childhood Early Intervention (ECEI) approach to assist children 0-6 years of age with developmental delay or disability. The ECEI approach is a tried and tested method and acknowledges that children have special needs that require different support to adults. For children aged 7-18, the NDIS also supports those with diagnosed disability. The NDIS is responsible for providing the funding and making the rules about the new way of providing disability support in Australia. The NDIA is the National Disability Insurance Agency. They are the people who will work with you to access the support your child needs if they are eligible for the NDIS. What does the NDIS mean for my child and my family? If you are currently receiving funding for your child, then the introduction of the NDIS means that the funding of your child’s services may be changing to a new model. If your child is not currently receiving funding, they will need to meet the NDIS access and eligibility criteria. To receive NDIS funding, you will need to work with a NDIS planner to get a NDIS plan for your child, which will document your child’s needs, goals and the supports required to meet them. The NDIS will give your child choice and control, and the support you need as your child’s life changes. To find out more about the NDIS and what it means for your child, get Yooralla’s free guide to the NDIS for your child. What is my child’s NDIS plan? Your child’s NDIS plan is a document that is based on your child’s goals and describes the funded supports they will receive from the NDIS. support that is funded by the NDIS (i.e. therapy, equipment). When the NDIS arrives in your area, you will meet with a planner to discuss your child’s needs for their NDIS plan. 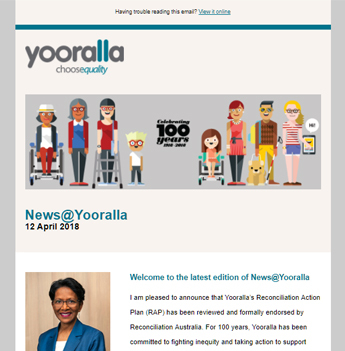 To find out more about your child’s NDIS plan and the planning process, download Yooralla’s free guide to the NDIS for your child. What will the NDIS fund for my child? The NDIS will fund ‘reasonable and necessary’ supports needed to meet your child's needs and achieve their goals. include and acknowledge help from friends, family and the community (informal supports). Your child’s reasonable and necessary support takes into account any informal support that your child already has. This means the support they receive from their family or broader community network. In determining reasonable and necessary supports, a planner will also consider what support is available via mainstream support – these are supports such as Scouts or playgroups. Examples of the types of things that the NDIS funds for children can be found in Yooralla’s free guide to the NDIS for your child. What won’t the NDIS fund for my child? is likely to cause harm to your child or pose a risk to others. The NDIS won’t fund inclusion support (extra assistance) for kindergartens, childcare services, outside school hours programs – or modifications to these buildings – because these are the responsibility of the early childhood education system. For school-age children, the NDIS will fund support that enables a child to go to school. However the NDIS won’t fund teachers or a standard classroom computer.